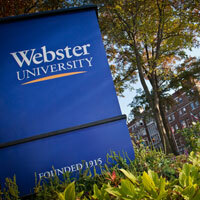 Webster University has numerous programs to help transfer students succeed in the classroom and on campus. Read the stories of three of those students. Heading off to college can be a stressful transition, but the experience can become more stressful if the student finds they want to attend another school and needs to navigate all of the rules and paperwork needed to transition credits to a new institution. At Webster University, about one-half of all undergraduates started their college experience at another institution. Most will start at a community college as a way to reduce costs with the express intention of finishing off general education courses at a local college, and then study a specific major at Webster. Some, on the other hand, will transfer to Webster from another four-year institution for a variety such as costs, wishing to be closer (or farther) from family, or deciding to change to a major that wasn’t offered at their previous school. Fortunately for those students, Webster University is nationally and locally recognized for student success of transfer students. According to Integrated Postsecondary Education Data System (IPEDS), Webster’s completion rates are ranked 2nd among its Missouri competitors, 2ndamong all four-year institutions in the St. Louis region, and 11th among its U.S. News & World Report competitors for full-time transfer students. The University also offers a wide-range of programs to make transferring to Webster easier, including offering scholarships, academic services, and unique orientation programs to help students fit in. 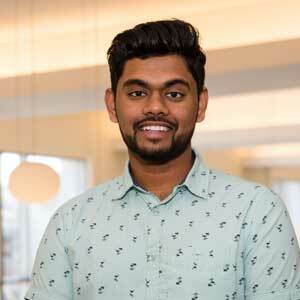 Three transfer students from diverse backgrounds including a small town, Sri Lanka, and the military shared their story about how they found Webster to be a good fit to continue their education. Webster’s student life, global community, and resources played a significant role in their transfer selection process. From the small town of De Soto, Missouri, Kaytlyn Clark yearned for a feeling of fulfillment in her college experience. Clark learned about Webster University through the numerous recommendations of neighbors and staff members at her former school, Jefferson College. 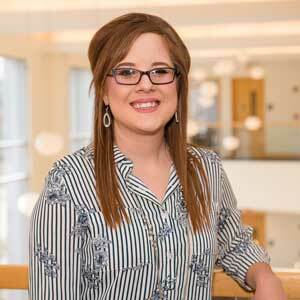 With the help of her academic advisor at Jefferson - who is a Webster alumna--, the Project Success program, and Phi Theta Kappa honors society, the first-generation college student was able to make her decision to transfer her junior year to Webster. Clark was impressed by the variety of degree options Webster offered, which led her to major in speech communications. What Clark appreciates most about Webster is feeling like more than just a number in the classroom. Even as a commuter who travels 45 minutes between home and school, Clark says she still feels connected to campus. “Webster stands out because it feels like its very own community. You feel included,” Clark said. Clark describes Webster’s campus culture as really helpful, welcoming, and inviting. Clark also immediately got involved on campus and took advantage of opportunities. Currently, she works as a Gorlok tour guide, a member of the forensic team, and interns for KETC Nine Network; which she found through the Webster internship fair. Clark says there are far more things readily available to her since transferring to Webster. “Webster’s diversity of students, unique opinions, study abroad program, variety of courses, and activities were things I wasn’t getting, coming from a rural area,” Clark said. Phi Theta Kappa also played a big role in Clark’s transfer decision. Clark was specially selected to be a part of their honors society by a faculty member at her previous school. The organization provided scholarships and a support system for first-generation college students like herself. Phi Theta Kappa gave her the confidence she needed to continue her education at Webster and made her feel that she was a part of something bigger than herself. Additionally, Webster was recognized by Phi Theta Kappa in February for the university’s support offered to transfer students. Clark recommends Webster University to prospective transfer students because the university made her transition easier and supported her every step of the way. “I feel that Webster’s number one priority is seeing me succeed and going out into the world and making a difference,” Clark said. Aathif Shamail is a native of Sri Lanka, who transferred from St. Louis Community College in hopes to gain more than just an education. Shamail wanted an enriching experience that would benefit his career goals and make connections with others. He was honored as a Phi Theta Kappa Distinguished Achievement Scholar to attend Webster, a full-ride scholarship that is granted once a year. He is a junior studying international business and feels that he has an advantage to learn different cultures. Shamail admires Webster’s globally connected campus, which attracted him to transfer the most. “Webster is very diverse and has people from all over the world. And the study abroad program is great and you can get a better understanding of people,” Shamail said. Shamail has only been in the United States for three years, but he has adjusted well to the Webster and St. Louis culture. Webster’s international student orientation and Connection Leader program and his advisor have been guiding lights to navigate on campus. Having an outgoing personality, he found getting involved on campus was not a problem for him. Currently, Shamail is a senator for Student Government Association, social media manager for SANGAM Indian Student Association, and previously served as president of Muslim Student Association. Shamail’s closet family member is in Illinois and while he does communicate with family in Sri Lanka regularly, his involvement with student organizations has kept him busy. He is grateful that his friends highly recommended the university for international students like himself. Shamail says it’s easy to connect and interact with the students and faculty at Webster. He encourages prospective international students to get active with student organizations on campus, network, and make friends because he says it’s a great way to obtain resources. Despite the cold St. Louis winters, Shamail wouldn’t change anything about his Webster experience. “I believe my overall experience here has been amazing. I’ve only been here for two semesters and I feel like learned a lot and connected to the community,” Shamail said. While James Taylor has an undergrad degree and a military career on his resume, he found his passion at Webster University by utilizing their resources along with his unique academic journey. He previously graduated from Mizzou with a degree in forestry and then served in the Air Force for 13 years. After retiring from service, he wanted to continue his education and explore his interest in the media and communications field. Taylor did his research, called several local St. Louis media companies, and asked what university they typically hire from. Many of the employers he reached out to brought up Webster University. Now a husband and father of two, Taylor is seeking his second bachelor's in interactive media. He says without the guidance of the Webster faculty and military benefits, he wouldn’t be able to make a smooth transition as a transfer student. Taylor is most grateful for the VetSuccess Program, especially his VetSuccess on campus Counselor (VSOC). The VSOC Counselors provide various services to student veterans such as education and training opportunities, adjustment counseling to resolve problems, referrals to health and community services, assistance for other veterans benefits and a mentorship program. Taylor says Webster stands out for its exceptional veteran assistance. “Not every school in St. Louis has a VSOC on campus. They relieved me so much stress by taking care of everything,” Taylor said. Webster’s VetSuccess Program also collaborates with the Vocational Rehabilitation Program, which gave Taylor additional assistance. Due to his military background, Taylor was able to get free tuition, a parking pass, textbooks, and a laptop through the Vocational Rehabilitation partnership with Webster. While he is grateful for the support he’s received from the veteran’s resources, he’s also been appreciative for the instruction he’s received in his major. He is excited about his interactive media major and enjoys learning a wide range of multimedia platforms. He also appreciates the small class sizes and the ability to network for jobs. Due to 96 credit hours he accumulated from the Air Force and previous credits from MU, Taylor will be able to graduate this upcoming May after just a year and a half at Webster. After graduation, he plans to pursue his career in the interactive and digital media communications. 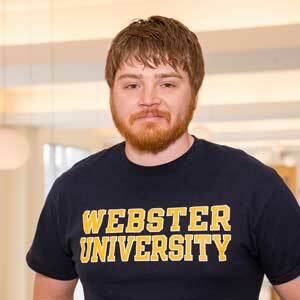 Taylor highly recommends Webster University to transfer student veterans. He advises other veterans to take advantage of all the resources the university has to offer and make the best of their experience. “Webster is ahead of the game. They have a leg up on veteran support and resources,” Taylor said.